I've had a thought for a while to blog about certain non-profit organizations that are important to me or that I think are doing good. I've decided to try posting once a month on a Friday. I'm calling this "Friday's Child" because the childhood poem says "Friday's child is loving and giving." I am happy to feature the Monkey Do Project as my first "Friday's Child." When I was a sophomore in college, I participated in a mission trip to the Appalachian region of eastern Kentucky the week before Christmas. The small group I was with packed and delivered food baskets and other items, which was the only Christmas many of the families we visited would have. I remember driving past boarded up, ramshackle houses that I would have assumed were abandoned except for the fact that smoke was trickling out of the chimneys. We visited a family with two boys. Their mother sat in a chair and graciously accepted our offerings while the boys looked on. There was no myth or magic of Santa there. My most vivid memory from that trip was packing up stacks of flattened cardboard boxes and transporting them to the house where two elderly brothers lived. I would guess they were in their 70s. They lived in one of those surely-this-is-abandoned houses. They invited us in and the living room was dark. Everything was dark, except for the bedroom to the right. We all crowded into this tiny bedroom -- the two brothers, seven or eight volunteers, and the brothers' tiny dog with paralyzed back legs. He propelled himself around with the help of wheels harnessed to his back . The brothers -- they had names that I've forgotten -- explained that in the winter, they closed up the rest of the house and lived only in the bedroom because that's the only room they could heat, nodding to the wood stove in the center of the room. The brothers offered us a seat on the one twin bed. They took turns sleeping in the bed. Whoever didn't get the bed slept in an old recliner. We glanced at the bed with its dingy gray sheets that clearly had not been washed in a very long time and politely declined their offer. They thanked us for the cardboard and that's when I noticed the walls...covered in flattened cardboard boxes to keep out the wind. We had carried in with us their winter's insulation. Soon, we left and I felt ashamed. Those two brothers offered us what they had -- a seat on their bed -- and we turned it down. We in our sturdy jeans and warm winter coats deemed their gift unfit. It's a lesson I'll never forget and it's given Appalachia a place in my heart. So when my friends Jackie and Crystal said they made a pledge to use their Monkey Do Project to fill a food pantry in Appalachia -- this one in West Virginia, I knew I wanted to help. The Organization: The Monkey Do Project is a registered non-profit that focuses on the most distressed areas of Appalachia, defined by the US government as the poorest regions in the country. Monkey Do works as an outreach to partner with groups, churches, organizations and other non-profits to provide for the most basic needs of people in those areas. The Problem: Summer starvation. Most children in this region of the country get two meals a day at school. During the summer, school is out and so is the children's opportunity for breakfast and lunch. The Pledge: The Monkey Do Project is partnering with a food bank in Clay, West Virginia to help fund their summer food program. This program is designed to help replace the two meals a day kids get at school - for many of these kids, those are the only full meals they get in a day. Two previous drives organized by Monkey Do have made a great impact on the ability of the food bank to meet the needs of the area. How You Can Help: Give. Donate what you are able through the secure giving form on the Monkey Do Project website. Pray. Jackie and Crystal and others involved in the Monkey Do Project know the power of prayer. I ask that you pray for the people of Appalachia and for the success of the Summer Starvation/Fill the Food Bank project. And if you want someone to pray for you, there is a place you can leave your requests on the Monkey Do website, too. Thanks to the Monkey Do Project for the photos above. 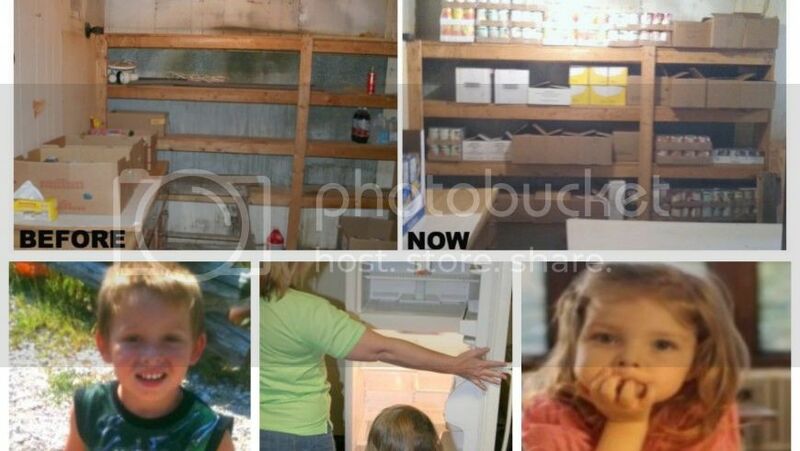 Those are actual photos of the Clay, West Virginia food bank when Jackie & Crystal visited last fall. Since then, Monkey Do has worked to keep the shelves of the food bank stocked.